Nice try, but RWD always triumphs over FWD. Always. You gotta give credit where it’s due, specifically in the case of the early 1990s Ford Taurus SHO. Ford still builds this car today, though its relevance is dwindling – literally – by the day. In 1994, Chevrolet had the Lumina Z34. Dodge sold the Spirit RT. Both sucked, let’s be honest. Only the Taurus SHO made a sincere effort to be a true sleeper, but it never reached BMW 5 Series status. Regular Car Reviews, in its typical poetic style, found a 1994 Taurus SHO owner willing to hand over the keys to his longtime ride for a day of driving. To its credit, Ford offered a manual transmission alongside an automatic, and this was definitely the way to go. But most buyers couldn’t be bothered with rowing their own gears. Under the hood was also something nice: a Yamaha-built V6. It was a decent enough engine, especially when compared to the non-SHO engine offerings. Even with the manual, however, the Taurus SHO was no BMW 5 Series alternative, not for enthusiasts at least. So who ended up buying this car? Likely "Buy American" only consumers. Again, let’s be honest. The Taurus SHO was also a heavy sucker, doing some 3,500 lbs. worth of damage to scales. It was also front-wheel-drive, unlike today’s AWD SHO. The 5 Series was rear-wheel-drive. And it weighed less. Which of these two would you rather daily? Of course you’d take the old Bimmer. 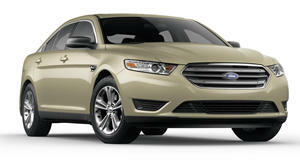 The Taurus SHO pulls great on the highway, but it’ll slam you into a guardrail if you corner it too hard. Still, Ford at least made a decent effort at building a sleeper, unlike GM and Chrysler at the time, and it should be applauded for its efforts.